Unable to view Large images? NASA's Mars Exploration Rover Spirit is approaching an outcrop dubbed "Methuselah," which scientists intend for the rover to examine in detail for several days before resuming an uphill climb. This false-color view is assembled from frames taken by Spirit's panoramic camera on the rover's 454th martian day, or sol (April 13, 2005). It shows a region in the "Columbia Hills" slightly downhill from the rover. The view features two interesting outcrops in the middle distance and "Clark Hill" in the left background. 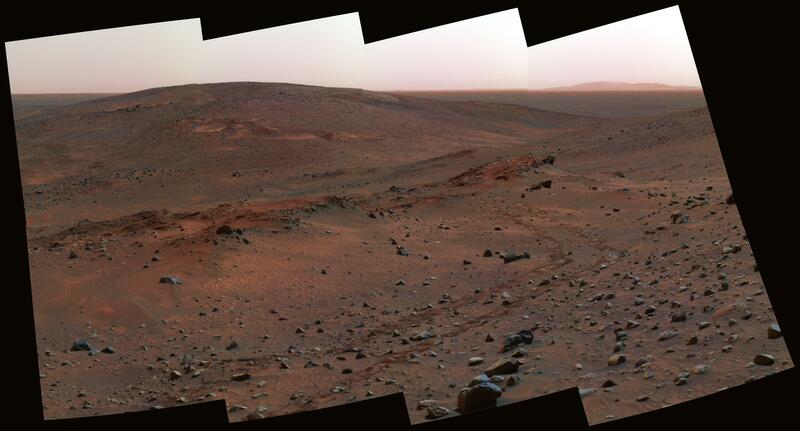 The outcrop on the right, with rover tracks leading from it, is "Larry's Lookout." On the left is the Methuselah outcrop, with apparent layering. This view combines images taken through the camera's 750-nanometer, 530-nanometer and 430-nanometer filters.